Welcome to Four Oaks Country Club! Four Oaks Country Club boasts an 18-hole championship golf course located in the heart of the Merrimack Valley. With meticulously maintained fairways, greens and breathtaking views, our golf course offers an enjoyable experience for both novice and expert players. Enjoy technologically advanced GPS systems on all golf carts for your convenience. The average pace of play for an 18 hole round of golf is less than 4 hours and 30 minutes! 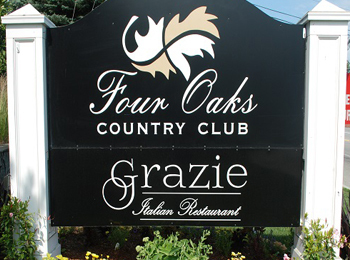 Four Oaks Country Club is located in Dracut Massachusetts and just minutes from Routes 495, 93 and 3. Relax in the Oaks Bar & Grille before, during or after play. We offer a full menu for lunch and dinner, and a great selection of beer, wine, spirits and refreshing cocktails! Watch your favorite sporting events live on one of our six flat screen TVs. 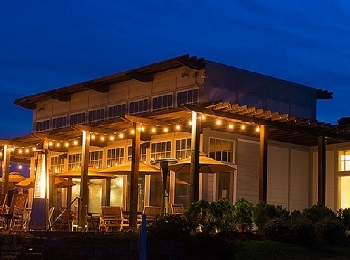 The Oaks Bar & Grille now features live music every Thursday through Saturday evening. Visit our award-winning Grazie Italian Restaurant. It is a destination spot all on its own. We feature a beautiful open kitchen and an amazing wood burning pizza oven. You'll be transported to Italy with Executive Chef Beni's incredible cuisine while enjoying gorgeous views of the Merrimack Valley from our new dining room. The beautiful outdoor patio overlooking the golf course is the perfect place to savor a cocktail while you watch the most beautiful sunsets in New England! Book your next private event with us in the beautiful Grand Oaks Ballroom. It is the perfect setting for your wedding, christening, bereavement meal or any social occasion. With the flexiblity to accommodate events of all sizes, Four Oaks Country Club will work with you to organize an intimate gathering or elegant wedding. The Grand Oaks Ballroom can host up to 260 people or can be divided for smaller functions. 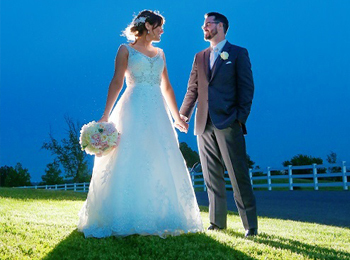 Click here to see how Four Oaks Country Club will help to make your wedding memorable. Fox Hill at Four Oaks Country Club is Greater Lowell's newest adult community providing the comforts of suburban living within minutes of Route 93. We offer elegant one-level living carriage homes nestled on over ten acres of gently rolling hills in historic Dracut, Massachusetts. Abutting Four Oaks Country Club, Fox Hill is designed with comfort and luxury in mind. Click here to learn more about Fox Hill at Four Oaks. We look forward to seeing you at Four Oaks Country Club! The golf course will open March 28th for 2019 season!!!! Click here to view membership categories. Become a Member of Four Oaks.